The opening reception on Saturday, July 16 from 2-5pm. 22 Kings Highway, Orangeburg NY 10962. This is about 30 minutes north of New York City. The exhibit will run through the beginning of September. The Vytlacil Art Campus is a lovely 15 acres site which includes the gallery and workshops. Tagged Central Park Shadows, Elizabeth V.Sullivan Gallery, Hudson valley art exhibit, Vytlacil Summer Exhibit 2016. My recently completed paintings of manikins are a reference to the confining, and yet sometimes unfortunately alluring, aspects of gender roles for women. The manikins are trapped in windows, surrounded by gendered lovely lures. Please look carefully at the one with two manikins titled Eve. actually please look look at all three. 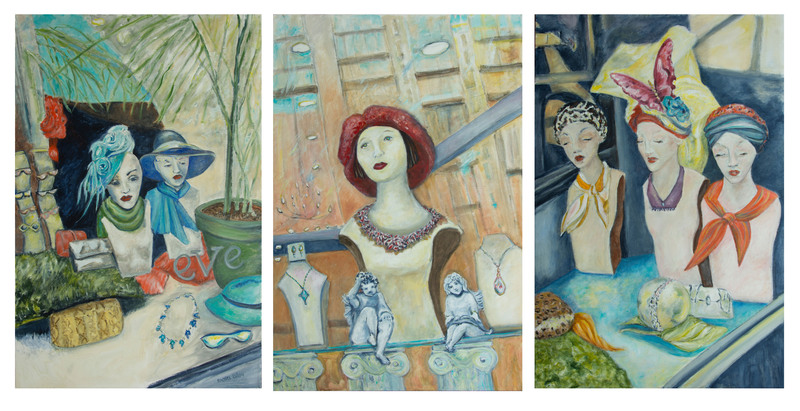 The three manikin paintings are 24 x 36 each and they are acrylic on canvas. I like them as a triptych and singly as well. I have had a very prolific several months of painting, 14 paintings in 6 months, plus drawing and sketches. Three of my recent paintings where exhibited in the Art Students League group show in April. My most recently completed painting is a “Child’s Dream”. It is a child’s mind view of the old beloved doll house, which has been enjoyed, damaged and played with by 3 generations of our family. It will be photographed this week. The family doll house lovers who have seen the painting all want it! A terrific compliment. I will have the painting photographed and look into creating Giclee prints! I will be painting semi-outdoors for the summer on the large screened porch of my summer home. Tagged gender roles of women in paintings, paintings of manikins.